This week we start a new theme. It came up because many of us give advice often, regularly, and in a way that others find annoying and even hatefully superior. You might ask people who are in contact with you often whether they want unasked for advice from anyone, even “sage” you? An adage that carries a lot of truth is that it is better not to give advice unless asked for it. 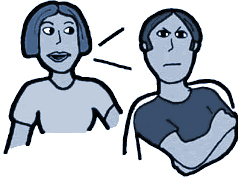 Lots of people talk into order to vent or to bond with the similar troubles of another. They don’t want any advice that would involve changing themselves. Giving advice, in those cases, becomes an exercise in futility. If you are already one who never gives advice unless asked, you could spend the week observing others to see what is good and what is bad advice in terms of content, but also in terms of negative aspects you observe. You could affirm people who do ask for advice with a willingness to consider change. I was startled when a person in Al-Anon (for relatives of alcoholics) told this story: My alcoholic father left when I was the oldest child. At 14 I had to take care of the family while my mother was out working. Relatives came giving me advice. I wanted to say, “Why don’t you ask how you could help instead of giving me advice?” Do I do that sometimes – give advice instead of help or give advice in place of feeling with empathy into the pain of the others? Dr. Ronda’s examples: I had a lot of instances where I could practice the principles above. I am a widow of 18 years but the other grandmother visiting the house I am is a new widow. Even though I told everyone I would not give advice without being asked, I insisted that the other grandmother widow check out EWTN in England where she lives. I showed her some of the programming. At other times during the day, however, my advice was not so good even if the content was right. Suggesting that in her extreme loneliness she consider moving in with a sister, also a new widow, made no sense since she doesn’t get along that well with that widow. Maybe a few years down the line the advice would be better? I felt better sharing an insight that helped me without mention of her trying the same thing such as going to Grieving groups. I could clearly observe that I often use quick advice to avoid the pain of empathy. Prayer: Holy Spirit of love, please help me, step by step, during this long week of trying to practice loving ways to give advice. You know how much out of love I want to help hurting people, but you also know that enjoy being the “sage.” Purify my heart.